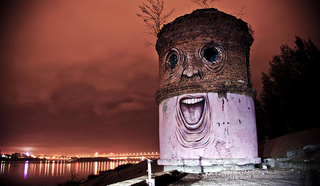 Graffiti artist Nikita Nomerz travels around Russia with a cool project called The Living Wall, where he brings old architectonical structures to life by painting playful human faces, eyes and hands on them. Nikita Nomerz is a graffiti artist based in Russia. You can follow him on Facebook, Twitter and his website.